After years of suppression by Mongolia's former communist rulers, the great Mongol warlord Ghengis Khan is back at the top of the national agenda, almost 800 years after his death. His wizened image appears on everything from vodka bottles to money. Scientists too are rediscovering Ghengis' history. The American-funded Ghengis Khan Geo-Historical expedition has spent three years exploring sites associated with the kahn's life. Yet one mystery remains, the site of his burial. John Woods of the University of Chicago is the expedition's team leader, and he thinks it might be at Ogloochiin Hereem, in remote Hentii Province. "One of the interesting things is the tomb of the 100 soldiers," he said. "Legend has it that 50 soldiers were detailed to bury him and they were killed by 50 others who in turn killed themselves. Ogloochiin Hereem consists of a 3 kilometre-long stone wall that was believed to be an old fortress. Yet last year, Mr Woods and his Mongolian counterparts identified 30 or so intriguing depressions within the wall. The site turned out to be a graveyard. "In one of the depressions, about 80cm down, we came across a flagstone layer, and underneath that there was evidence of charcoal, burning, animal and human bones." "Some of our Mongolian colleagues continued to work and they found the fully preserved skeleton of a man in a wooden coffin with some iron artefacts and implements," he said. Work begins again this month to uncover more of the burial depressions. 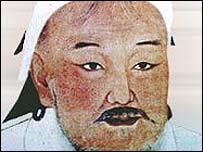 Since no tomb of any imperial-era khan has been found, no one is sure what Ghengis' tomb might contain. "Cartload after cartload after cartload of booty streamed back into Mongolia from China and the Middle East at the time of Genghis Khan's conquest," said Mr Woods. "None of that has ever been found. One argument runs that no object from that period has ever surfaced in any museum or private collection anywhere in the world. So where is all that stuff? ", he said. Ghengis Khan's exploits tend to instil a sense of pride in the Mongols, the same pride that often reveals itself when the matter of tomb is brought up. The problem is, that if the booty is uncovered, there is universal fear that it will be plundered once again, this time by the private American investors who are funding the expedition. "In my opinion, digging up the tomb is a bad idea," said Aruntuya Purevdorj, a student at the state University. "I am a nationalist, so I do not like foreigners digging up Mongolian graves, why can't the Mongolians do it themselves? Mongolia is a very developed country and we can handle such matters on our own." So unpopular is the expedition that it was forced to shut down early last summer after a complaint was launched by former Prime Minister Dashiin Byambasuren. "I visited the site last summer and I saw a lot of cars and trucks there," said Mr Byambasuren. "They were driving on top of this sacred ground and putting up buildings right near the wall. They were cutting down trees, digging up holy soil, and putting human bones in pans. It seems that they want to build a tourist attraction." Mr Byambasuren's outrage stemmed partially from the old Mongolian belief that disturbing the grave of an ancestor will destroy his or her soul. But also of great annoyance, said Mr Byambasuren, is the driving force of private investment. "Any such research must be government sponsored. For example, as a private citizen I cannot just go to England and dig up King Richard's grave," he said. "Nor for that matter, the graves of Abraham Lincoln or Napoleon. It is the same thing here. A national referendum on the matter must occur and the government must keep out private investment." But strapped for cash, Mongolia feels it has little choice but to do what it can to boost hard currency and tourism, the sector that would most benefit from the tomb's discovery.